Growing up, my Mom always kept our home spotless. I can’t remember a time when we went to bed with the kitchen dirty, or I was embarrassed to invite friends over because of a mess. Once I got married, I wanted to create the same peaceful, clean atmosphere in my home. And I failed miserably. Our space was always a wreck, constantly cluttered and dirty. I’ve found over the past few years that the key to keeping things clean and tidy is discipline and simple systems to make cleaning quick and painless. I feel ridiculous writing about this because with a seven-month old baby, there are several days where our space is far from clean. But I thought I would compile tips and tricks that I’ve picked up that make keeping our home clean not so hard these days, in hope that it helps at least one person. This is a huge one. Less stuff means less to clean, less time wasted, and less stress. Dusting is a quick, easy task when all I have to do is a swipe over an empty surface rather than moving several individual items and dusting each one before putting it back. 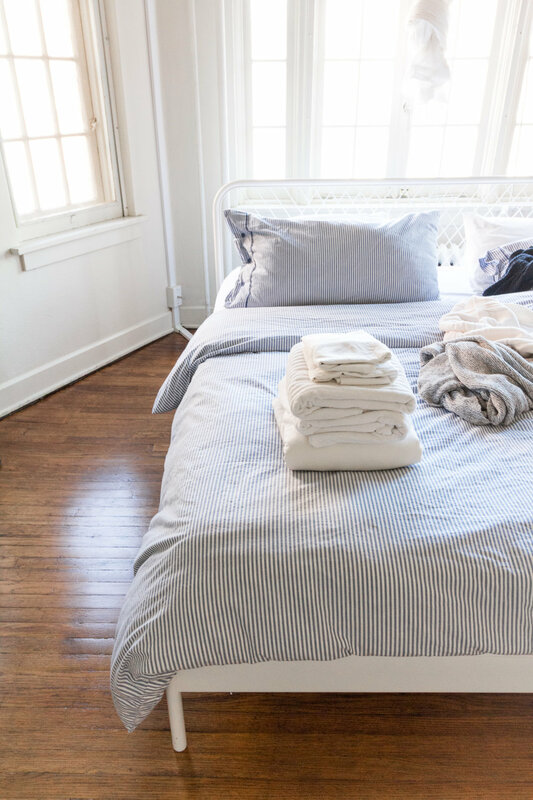 Folding laundry is quick with less clothes, washing the dishes is easy with just a few plates, and vacuuming around furniture is fast when there is simply less to deal with. Read my blogpost on 15 Things to Declutter to get started right now! Have a specific place for every item you own and make sure it is ridiculously easy to put away. I find I usually don’t put away certain items when they simply don’t have a home or it’s difficult to put them back where they belong. I used to get overwhelmed and feel the need to reorganize all our stuff before I even got to taking care of the dirt. Make it so you never have to question where an item belongs and your clean-up time with be significantly faster. Every day, for twenty minutes, power clean your home. The key is no distractions - no phones, tv, nothin’ - and to clean the fastest you possibly can. I’ve been doing this everyday for months now and have noticed a huge difference in our home. I now no longer have to carve out an entire day to do a huge clean-up. It is amazing what can be done in such a short amount of time, even better if you can get your spouse or a family member to help out! To help with your 20 Minute Clean Up, create systems! Make a checklist that’s logical for cleaning your space (dust first, mirrors second, vacuum last, etc.) and stick to doing the same exact routine every time. Over time, you’ll get faster and faster - I’ve got our bathroom down to just ten minutes total! Keep any cleaning supplies or tools that you own in a specific bucket that you can grab while doing your 20 Minute Clean Up. I learned this one from a previous job I had cleaning vacation rentals. Sounds super simple, but having a bucket of all your cleaning supplies together means you can easily carry them with you room to room while speed cleaning. I also have a cute tray next to our sink with our cleaning sprays that I use on a daily basis (I love these amber bottles for making our countertop spray look cute). Making your supplies easy to grab and move around the house makes cleaning a little bit easier + you avoid having to navigate the disaster zone underneath the sink. Let me know if any of these tips were helpful or new to you! Reading cleaning tips is one of my favorite things to do in my spare time (I’m crazy, I know) so let me know if you have any I could use!